Our Vancouver auto body shop is located at 8250 St George Street and serves the communities of Burnaby, New Westminster, Richmond, Delta, Ladner, Coquitlam, Newton, and Steveston. In fact, 24HR Collision Center has been part of the Vancouver auto body industry since the 1970s. Over the years, we’ve grown with our city, continuing to expand our auto body services, earning more certifications, and striving to meet the needs of our customers. Our goal is to make the auto body repair process as easy and convenient as possible to meet the needs of a fast-paced urban lifestyle, while never sacrificing quality. Our Vancouver auto body technicians perform collision repairs and auto body work at the peak of industry standards, utilizing the latest equipment, training, and resources. We work on all American, European, and Asian vehicles, and at 24HR Collision Center, every job and every vehicle are treated with the same attention to detail and level of care. If you’re looking for auto paint or color matching, you’d be hard-pressed to find a more skilled auto refinishing shop in the Vancouver area. Auto Accident in Vancouver? Call Us to Pick Up Your Damaged Vehicle! We know needing auto body repairs after a car accident or other incident is never convenient or welcome, so we work hard to do everything in our power to make it easy for you! You want to get back on the road as quickly as possible? We aim for promptness and accuracy to avoid repair delays or any rework. You need to drop your car off before work? Our Vancouver shop opens at 7AM. You need us to pick up your damaged vehicle? We offer free vehicle pick-up and courtesy loaner cars with ICBC claims. 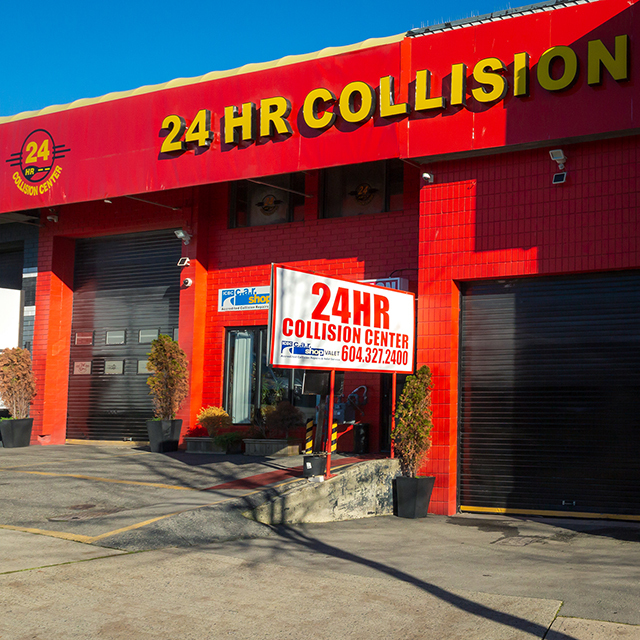 For the best auto body repairs in Vancouver, BC, call 24HR Collision Center. We believe excellent service is not only performing all your auto body repairs perfectly, but also giving you the VIP service you deserve. Call or text us today at (604) 327-2400 and ask for our Vancouver location.